A couple of weeks before Christmas we got a new cooker. Luckily for me when it arrived it came wrapped up not only in poylstyrene but also some cardboard and packing wood. Once I realised that the cardboard was about the right size for the top of a new coffee table, it was a short step to using the packaging wood to reinforce it. 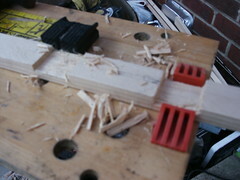 Despite not being very good or liking woodworking in school I managed to cut these joints into the wood. There’s about another 21 to go so it might take a while to finish it off. I think I’m enjoying this more than at school because I’ve got an idea in my head and I’m kind of working it out as I go along, not drawing it accurately but just using the wood itself as a measure. If you see what I mean.